Dandelions can be a real nuisance around the yard. Getting rid of them can be quite a chore but your yard will look much nicer afterward. 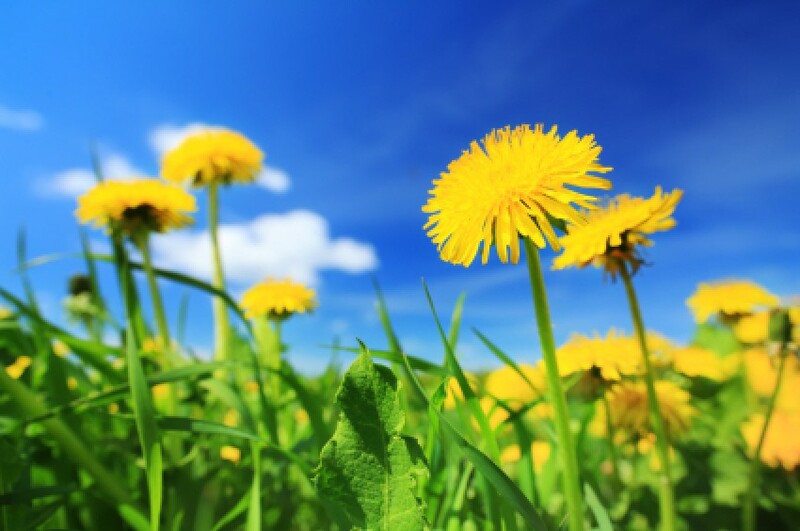 This is a guide about getting rid of dandelions. To kill weeds, spray them with vinegar when the sun is shining. Spray all the leaves. They will shrivel up and die. It is non-toxic to animals, etc. I have had great success killing off my dandelions with sulfate of ammonia, the 21-0-0 stuff (they must hate nitrogen). After watering, I just put a teaspoon of the dry crystals in the center of the damp dandelion. Since I'm a bit on the lazy side, I use a length of PVC pipe and a small funnel. I put the PVC pipe in the middle of the plant, dump in the crystals, then move to the next weed. I have an uproar of dandelions and daisies in my garden and I won't be able to get rid of them without harming the grass and leaving the lawn like a huge spotty mess. I'm dubious about using chemicals because I have two small children, any ideas? You can always go old-school and do it like my parents did when I was a kid -- remove them manually. Mom had old steak knives hidden throughout the flowerbeds, so if we saw a weed we could grab one and use it to dig out the weed, root and all. You wouldn't want to leave knives around with little kids, but there are various weed-popping tools on the market these days. No chemicals to worry about, and inexpensive. My parents had the best lawn on the block. I used to pull them (live in an apartment so no lawn care for me right now) out using a screwdriver to get at the roots. Another option is to pour boiling water to kill them and the roots, but that also will kill the grass around it so I'd go for the screwdriver. It's tedious, but it's the best option I've found that doesn't involve chemicals. You can spray the flowers with white vinegar. The acidity will kill them. Or you can harvest the dandelion and use it in your salads. I use a mix (2:1) of dish soap(dawn) and vinegar and spray it on the area. It will kill nearly anything, so don't spray it where you have grass you want to keep. Boiling water also works well. However, the vinegar dawn mix is much easier to carry around in a spray bottle. You can get weed and feed to take care of them. Does anyone know ways to kill dandelions and hedges without herbicides? The only way I know of is to take a skinny trowel or long toothed forked out there and dig them up as soon as you see them. It's a bit of work and is a lifetime commitment, but well worth the effort. My new husband and I are reclaiming several garden beds and the lawn-one dandelion at a time, lol! We have agreed that every time we are outside we will dig at least one up apiece. When we leave the house we each dig one up and drop it in the bin. When we come back, we dig up another one each. Whenever we go out to hang washing out, pick some greens for the salad, visit over the fence with the neighbors, whatever, we dig up at least one dandelion. I concur with frugalsunnie. Manually is a sure-fire way to get rid of them without any chemicals. When we moved into our house there were massive shrubs lining the walk up to the house. It felt like walking down a dark tunnel. I didn't like the looks, plus it was a potential hiding spot for bad guys. So my mom and I dug them up. Those things must have been there for over 20 years (huge roots!). It took a lot of digging and prying with shovels and forks, but after much sweat we got it done. For weeds you may want to try full strength vinegar. Just drip it on the undesirable weed, careful not to get the grass. Given time it will kill the weed. How do I get rid of dandelions in my flower bed? I have been cutting them to the ground, but many have roots that are way too deep for me to pull or dig. I've sprayed with vinegar and they turn a little brown and bounce right back. They have special tools for getting dandelions out. I got it at a garden center. I had over 300 pulled out in one afternoon using the tool when I moved into my home. You have to be diligent, and you will get rid of them. Put a little bit of salt on the center of the dandelion and after putting the salt, if you have enough space to do not damage the others plant next to the dandelions, water them with boiling water. In the next few days you will be able to root them out easily. The perfect tool to root them out is the asparagus knife, the simplest type, long and straight, you push it into the soil along the root of the dandelion and when it is deep enough you bend it to the side. You can also cut all the flowers of the dandelions before they reach the stage when they send seeds everywhere. You could also, only if you do not use chemical fertilizers, eat your ennemies ! because dandelions leaves make a delicious salad and their flowers a delicious liquor and jelly too. Cut each of the roots and cut the flower off. If I doesn't work just don't water it :) Hope I helped. Well, there are several waysto kill Dandelions. 1. You can spray them with a Dandelion killer. 2. Dig them up making sure you get all the root. Some people cook and eat the leaves. 3. Try vinegar. Be careful as vinegar will also kill the grass. 4. Not watering them will not kill them.They just go dominant. 5. Other posters may have more suggestions. How can I manage the clover in my lawn (I want more clover) and get rid of dandelions? I like the clover, but I don't like the dandelions. If our so called recession gets any worse you might want to eat those dandelion greens. They are quite tasty. I had them as a kid I don't know about the blossoms but the greens are great. Do some online research before you put herbicide on them. Nasturtiums are edible too. Hosta's, geraniums and purslane (a so called weed) are all extremely healthy. Check it out. I am a baseball coach and we are having trouble killing the dandelions on our field. What might you suggest we do? Put gas in a squirt bottle. Put it on every weed, good luck. These homemade recipes and tips sound great but I do not want to kill the lawn tried to get rid of dandelions last season and had dinner plate size dead patches in my lawn which had to be reseeded, this year hundreds more dandelions are growing around the outskirts of where the original plants were, help any tips for getting rid of without killing the lawn. Do you have a recipe for killing dandelions, please? Does anyone have any ideas on getting rid of dandelions in your yard? We bought some type of spray to use on them in Walmart, but they have come back. Get a weed popper. It is essentially a 4 pronged fork very strong with tines about the diameter of a pencil, round, and pointed. It has a handle about 3 feet long. And is hinged to the popper. You place it by hand behind the weed then use your foot to stomp the fork under the weed and it will pop out.